The cofounders of Leaping Frog Films, husband and wife team, Kent Cornwell and Shelly Solomon, are modern-day storytellers. They have made it their mission to bring to the public stories of dedicated people working to restore and protect the natural environment. Films available for public outreach & non-profit fundraisers. Please email us to get on our film showing locations notification list and to pre-order films. 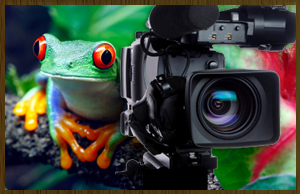 Call Leaping Frog Films ... 360.385.3998 E-mail us by clicking here!